It was after much deliberation that this TOTO UltraMax II Toilet review was planned and executed. At a time when manufacturers are on overdrive with tech-infused toilets, how does Toto manage to stay relevant with this seemingly simple, one-piece toilet at a price point that’s considered less than competitive? That’s because it works. Despite all the talk about fancy features, when it comes to toilets, most homeowners want something reliable that looks good, is comfortable to sit on, flushes clean and does not clog. That pretty much sums up the Toto UltraMax II for you. It’s nothing fancy. 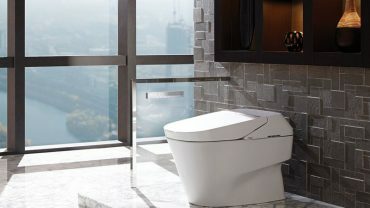 It’s just another flawlessly designed toilet from Toto. Here’s a detailed Toto Ultramax II review. 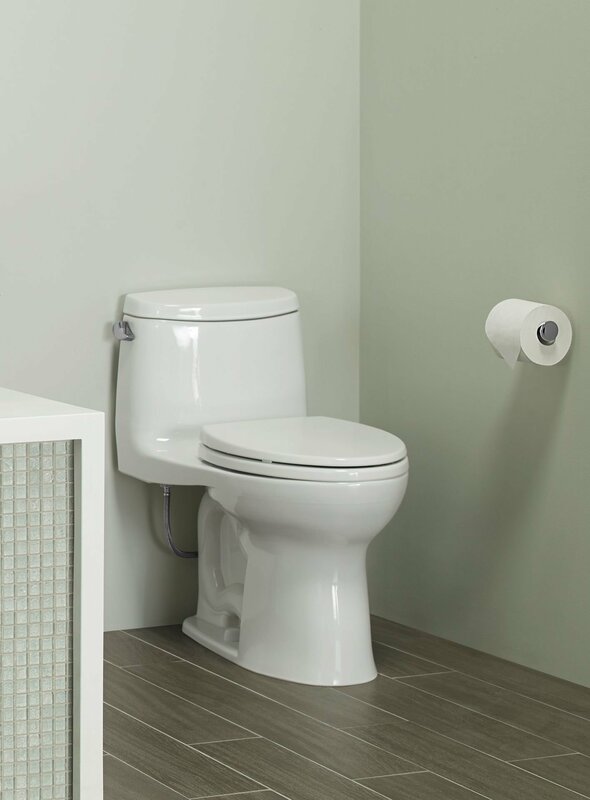 The Ultramax II is an ADA-compliant, one-piece toilet with a compact profile available in three colors. The cotton white is the most popular one as it easily blends in with any wall and floor-tile combination. It is 28 3/8 inches long, with a standard 12-inch rough in and 16 ½ “wide. Initially, there were some concerns about compatibility with the existing installation. But that were quickly put to rest by the plumber, who described the entire installation process as a cakewalk. The bowl is ever-so-slightly elongated. Also, this is a comfort height toilet. Tall users, as well as the elderly, will find it more comfortable to sit on this than on regular toilets which require them to half-squat to sit on the seat. The Toto Ultramax II also includes a soft closing seat made of tough, glossy Polypropylene that remains impervious to scruffs and stains. Also, it closes gently, eliminating the annoying slam that comes with cheap seats. One of the reasons why the Ultramax II scores over the competition is because of Toto’s patented Sanagloss coating on the 2-1/8” wide trapway. This is a superior glazed, ionized coating that prevents the trapway from getting stained or skid-marked. Think of it like a super-glossy layer on the china, that repels particles of all kinds. Not only does it ensure a completely clean toilet on every flush, it also prevents dust and debris from settling on the toilet bowl. The Sanagloss trapway makes the Toto Ultramax II almost maintenance-free. You just need an ordinary detergent to rinse and clean it. No more toxic, caustic cleaners at home. The Toto Ultramax II is a gravity-flow toilet with Toto’s popular Double Cyclone flushing system. Unlike conventional flush tanks, the Ultramax II features a large 3” valve that releases 1.28 gallons of water at a high speed. The water is then directed to three nozzles. There’s a siphon jet near the trapway which creates the centrifugal suction and there are two nozzles just under the rim which eliminate skid marks. The force created by the flush is so powerful that it needs just 1.28 gallons to completely clean the toilet. If a High-Efficiency Toilet is mandatory in your state, like in California for example, then here’s one that does not compromise on the flushing efficiency while reducing the consumption of water. After a flush, it takes just 10 seconds to refill the tank completely. And it does it in a soft, whispering gurgle mode. L 28 3/8" x W 16 1/2" x H 28 3/4"
Despite having some of the best features in-class, the Toto Ultramax II is often pitted against the Kohler Cimarron. Both are one-piece, comfort-height toilets with an elongated bowl. However, the similarities end there. The Ultramax II is more advanced and efficient than the Cimarron in every way. Here’s why. The Ultramax II has a Sanagloss coated trapway that makes it almost impossible for solids to adhere to the surface. This might sound gimmicky at first. But any user who’s used a Toto toilet with Sanagloss coating will never go back to a toilet without the coating. The Cimarron might have a glazed trapway. But the Sanagloss coating makes all the difference. 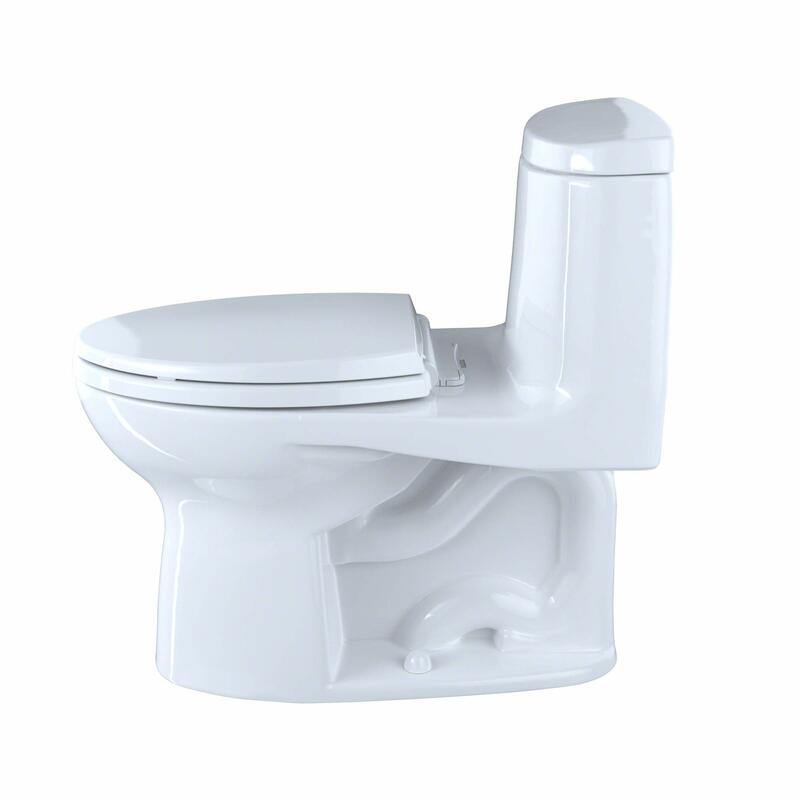 The Toto Ultramax II ships with a soft-close seat whereas the Cimarron ships without it. So, you are looking at spending an extra $50 or so to get the seat. The older Kohler Cimarron featured the flap way-assembly in the flush which reduced efficiency and the toilets were a pain to manage. Frequent clogging, skid marks, customers had a torrid time. Kohler has upgraded it with a class-6 flushing system which is more efficient than the older one. But it’s still no match for the Double cyclone flushing system of the Ultramax. This is clearly, a more efficient flush that uses less water. The only possible argument is that the Cimarron is cheaper than the Ultramax. But don’t forget the added cost of buying a soft-close seat. And then the cost of buying cleaners to clean it, possibly for as long as you will use the toilet. The Ultramax II, on the other hand, is touted to be one of the easiest toilets to maintain. It’s a no-brainer decision. The Toto Ultramax II is the better pick any day. More bang for your buck. Fewer hassles.